Based in Singapore, we are the leading suppliers and exporters of SS Diaphragm Gauge. 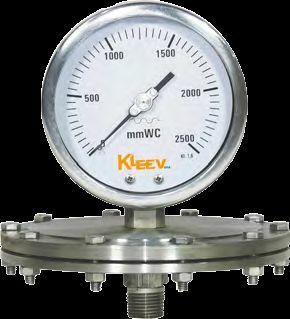 The SS case low and high pressure gauge of diaphragm type belongs to the KPG-12 series. Its nominal size is 100/150 mm and wetted parts are of AISI 316L SS / Monel Hasteloy c. Its accuracy is ±1.6% F. S. and lower point range is -6000 to 6000 mm WC and higher point is -1 to 25 bars. It has both the options of dry / liquid filled execution. It has the protection of IP67.